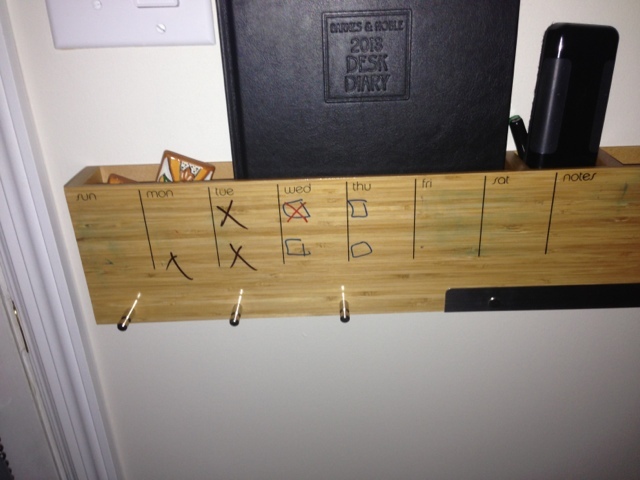 Last Friday Mom set up the dry erase weekly calendar to have checkmarks when someone feeds Billy, so he isn't fed extra as sometimes happens. In theory it is a great idea, but not so much when I went to erase the marks put there last week and discover the Monday evening and Tuesday ones don't come off. Apparently, someone (i.e. Mom!) used the permanent marker instead of the dry erase ones. The sharpie is in the organizer the calendar is on, but it was in a different slot and it is a retractable style marker and not one with a cap like the dry erase ones we have. Luckily I knew about using rubbing alcohol to remove permanent marker after having to do it off of pumpkins when working at the pumpkin festival last year and a group decorated theirs before realizing the pumpkins were not free. Calendar is now set back up with dry erase markers and sharpie is moved to junk drawer. Tonight Mik tried to have me go wake up Mom with the excuse that he did not know where Mom & Dad's room was. I thought he was bluffing, but turns out he legitimately did not know where their room was. I guess we forgot to give him a tour of the whole house after we moved in. Seriously, the house is smaller than our old one, but the layout is with separate wings, so you really can just use the common areas and not encounter each other's rooms for the most part, especially since Mik has his own bathroom rather than sharing like the rest of us do. At least Mik did vaguely remember my room was through the kitchen and he really did try to bluff knowing that he could get to my room right out the front door. He definitely knew that, as the other day when he came home with Dad they knocked there to ask me something. Having lived all his life in Arizona until this year, Mik was kind of mind blown when we talked about losing an hour overnight for daylight savings time. He knew about Daylight Savings Time and basically understood how it worked, but having only 23 hours in the day when the clocks spring forward had him staring trying to grasp the reality. In particular, because we were talking about driving home from Disney World today and gaining an hour when we got back in our home time zone, but would then lose the hour with Daylight Savings Time tomorrow. Bottom line was he could not figure out the purpose of Daylight Savings Time and likes it the way it was in Arizona, which we all agreed with.